Herbal and dietary supplements are found in the aisles of supermarkets and health-food stores rather than behind a pharmacy counter, but they can be dangerous when mixed with the wrong drug. MONDAY, November 15 (Health.com) — Herbal and dietary supplements are found in the aisles of supermarkets and health-food stores rather than behind a pharmacy counter, but they can be dangerous when mixed with the wrong drug. A new survey suggests that a majority of heart patients taking the popular blood-thinning drug warfarin are risking potentially dangerous complications by combining it with supplements such as fish oil, glucosamine and chondroitin, coenzyme Q10, and multivitamins. 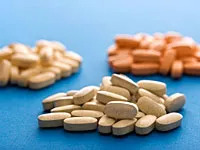 The survey, which included 100 heart patients in Utah, found that more than two-thirds were taking dietary supplements in addition to their prescribed blood thinner, in most cases unbeknownst to their doctor. Nearly half of the patients didn't view supplements as drugs. "More and more patients are self-medicating with these supplements," says Jennifer Strohecker, a clinical pharmacist at Intermountain Medical Center, in Salt Lake City. "Many of us will Google something and then go out and try it, and our doctor would never know." In a previous study, Strohecker and her colleagues found that 9 of the top 10 most commonly sold supplements had the potential to conflict with warfarin. The offenders included St. John's wort, melatonin, glucosamine and chondroitin, and fish oil. "Even your multivitamin can interact with warfarin," says Strohecker, who presented her research today at the American Heart Association's annual Scientific Sessions meeting in Chicago. Some supplements have the ability to either enhance or negate warfarin's effects, which could potentially trigger one of two dangerous complications: severe bleeding or a blood clot. In addition to recommending that doctors ask patients about supplement use, Strohecker suggests that patients who choose to take supplements do so consistently. "I also fully believe that there should be some cautionary statements or some labeling changes on the supplements themselves," Strohecker says. "It's a communication thing." The Scientific Sessions meeting highlights the latest heart-related research and treatment advances. Unlike studies published in medical journals, the research presented at the meeting has not been vetted by independent experts in the field.